Rotate your device for an optimal viewing experience. Powered by Clarins’ latest plant discoveries—NEW Extra-Firming Day and Night visibly lift the skin and minimize the appearance of wrinkles, with results you can see. Clarins gets to the source of firmness. For the first time, Clarins Research has discovered a reservoir of young skin cells that have powerful regenerating properties. As we age, these reserves are depleted—and it shows. Skin loses its firmness, wrinkles begin to appear, and facial contours become less defined. Clarins ethnobotanists traveled to Australia to study age-defying Kangaroo Flower—a plant known for its visible firming and wrinkle-fighting properties. 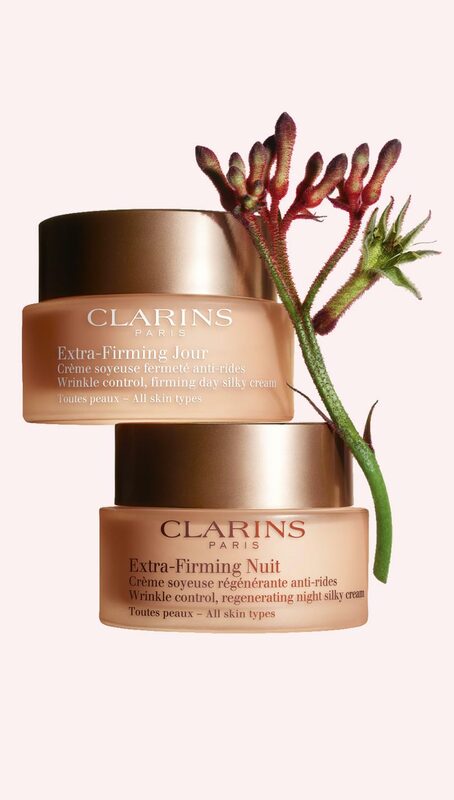 Firming comes naturally at Clarins. Clarins’ previous Extra-Firming treatments revolutionized the face of firming with plant-infused formulas that visibly tone and tighten skin. In 2018, we’ve boosted this action with the discovery of powerful new plant ingredients that take firming to the next level of excellence. At night, skin goes into repair mode. Your skin has its own internal clock. During the day, it fights off external aggressors like pollutants, free radicals, UV rays, and the effects of stress. At night, when you sleep, skin’s regenerative powers kick into high gear—especially between 11:00 p.m. and 2:00 a.m.—replacing damaged or dead cells with new ones. Why cellular renewal slows down. By comparing the nighttime activities of young and old fibroblasts—the collagen-producing cells that support firmness, elasticity and skin tone—Clarins has discovered that the skin’s ability to produce fresh young cells declines with age. 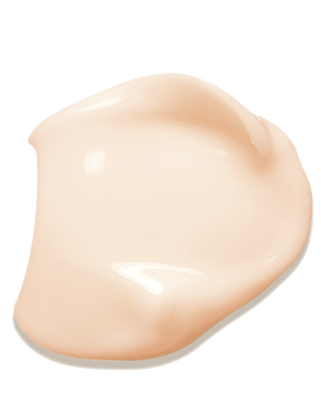 Hydrated Moonstone of Silica extract works overnight for visibly renewed, more youthful-looking skin by morning. Extra-Firming is a collection of firming treatments that delivers unrivaled results. Each formula contains the world’s most powerful key plant ingredients, and is a first-of-its-kind in the field of plant science. Firm skin is well-hydrated skin. Extra-Firming Day and Night are formulated with the most powerful hydrating plants for skin that is comfortable and moisture-perfected day and night. This super-quenching plant extract boosts the skin’s natural hydration, enhancing its ability to retain precious moisture in any environment. Skin needs as much protection as it can get from environmental aggressors. Clarins’ powerful Anti-Pollution Complex helps shield skin from the effects of indoor and outdoor pollutants that can lead to premature signs of aging. A red algae common to the coasts of the North Atlantic, Furcellaria produces a water-soluble gum which is used in food for its thickening, gelling and stabilizing properties. Clarins uses Furcellaria extract in Extra-Firming to create barrier action against pollution and moisture loss. As we age and our hormones change, skin is increasingly susceptible to discolorations and dullness. Extra-Firming contains powerful plants that even skin tone and boost skin’s radiance for a healthy-looking glow. An integral part of daily life in the dry regions of Africa and Asia—Organic Desert Date is used as food for humans and livestock, as a medicinal plant, and for building material and fuel. Clarins uses Organic Desert Date extract in Extra-Firming to help even skin tone. No matter how well you take care of your skin, cellular regeneration will start to slow with age, and signs of aging will set in. That’s why skin needs targeted firming treatments to pick up the slack. 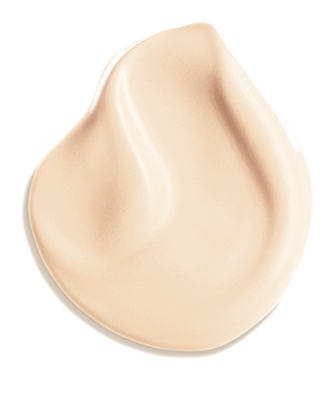 Long recognized by Clarins Laboratories for their instant toning effect, Organic Oat Sugars visibly lift, tighten and smooth skin to reduce the appearance of lines and wrinkles. For thousands of years, this wild cherry has been used by cultures throughout the world for its medicinal benefits. Clarins uses the extract from its seeds to boost skin’s radiance. Clarins’ top priority is to deliver high-performance products that are gentle to the skin. That is why all of our formulas undergo rigorous clinical and consumer testing to ensure the highest standards of quality, sensorial pleasure and, of course, results. We know that the ultimate judge of everything we do is you. *Satisfaction test – Extra-Firming Day All Skin Types & Extra-Firming Night All Skin Types – 103 women – 14 days. What makes Clarins so different? Clarins cares. We strive to create superb skincare experiences with cutting-edge formulas that deliver age-defying results—and luxurious textures that bring sensorial pleasure to your day. As pioneers of responsible development, we work to protect biodiversity, advance local communities, and protect the planet. Put more spring into your Extra-Firming routine by doing 3 daily exercises that help firm and tone facial muscles. Sit or stand, with your back straight—and get a quick power lift. Open your mouth, and smile as widely as you can, while lifting the outer corners of your lips. Open your mouth and push your tongue against the back of your upper teeth, as hard as you can. Reduce the look of smile lines—also known as nasolabial folds. Open your mouth to form an O; then curl your upper lip over your gums. In addition to unprecedented product efficacy, NEW Extra-Firming surprises and delights with aromatic plant extracts, five luxurious textures, and a fresh new look. Extra-Firming’s irresistible textures, and fragrant plant actives, soothe the senses for a total feeling of wellbeing. The Extra-Firming collection reflects Clarins’ commitment to preserving biodiversity, and making life more beautiful for future generations. 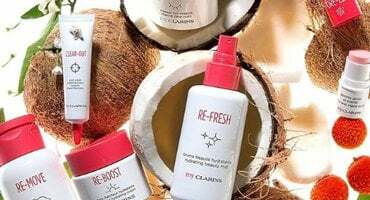 Recycle and reuse—that’s the Clarins way! Clarins helps protect natural resources by sourcing sustainable components, and promoting a circular economy that puts raw materials from recycling back into use. Today, recyclable materials, including glass and cardboard, account for 63% of Clarins’ packaging. 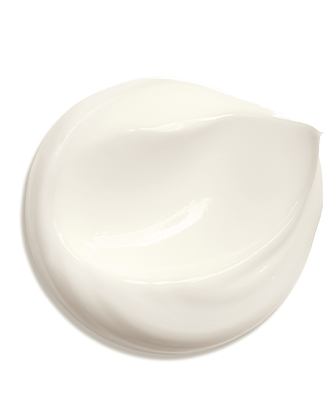 Extra-Firming contains 83% key ingredients, of which 40% of them are organic. 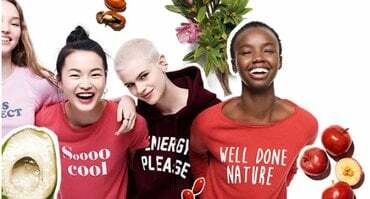 Two fair trade agreements in partnership with Jardins du Monde. The purchase price of leaf of life and mitracarpus includes a contribution to supporting economic and social development of communities involved in their harvest. Biomimetic” extraction: inspired by the vegetal intracellular environment to extract molecules hardly soluble in lipidic and aqueous phases, until now difficult to obtain by classic extraction methods. Agriculturally sourced, biodegradable green solvents.